In Issaquah, where Schrier has long had a pediatrics practice, she took nearly 70 percent of the votes counted in Election Day. In Sammamish, she won more than 65 percent. Vote counting continues. Kim Schrier’s victory over Dino Rossi in Washington’s 8th Congressional District last week was powered by big margins she ran up in King County suburbs, a map of Election Day results shows. 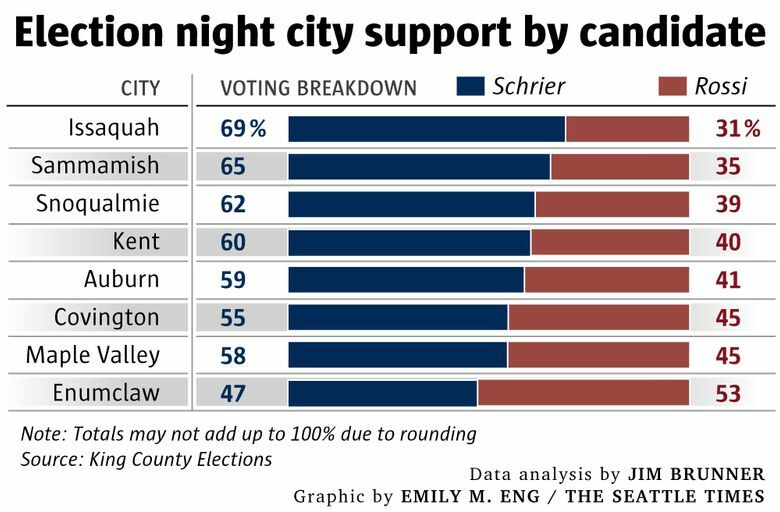 Schrier, a Democrat and first-time candidate, dominated the cities of Issaquah, Sammamish, Auburn and Kent, according to precinct-level data for votes counted on election night by King County Elections. In Issaquah, where Schrier has long had a pediatrics practice, she took nearly 70 percent of the early votes. In Sammamish, where both she and Rossi live, she won more than 65 percent. Rossi, a former Republican state senator, had previously carried the 8th District during three unsuccessful bids for statewide office. But he was swept aside this year by Democratic enthusiasm in the midterm backlash against President Donald Trump. Rossi’s longtime Sammamish precinct preferred Schrier by an 8-percentage-point margin in the Nov. 6 vote tally. The portions of the 8th District outside of King County — including eastern Pierce, all of Chelan and Kittitas, and a sliver of Douglas County — favored Rossi by more than 13,000 votes as of Tuesday. But that was overwhelmed by Schrier’s lead of more than 28,000 votes in King County. 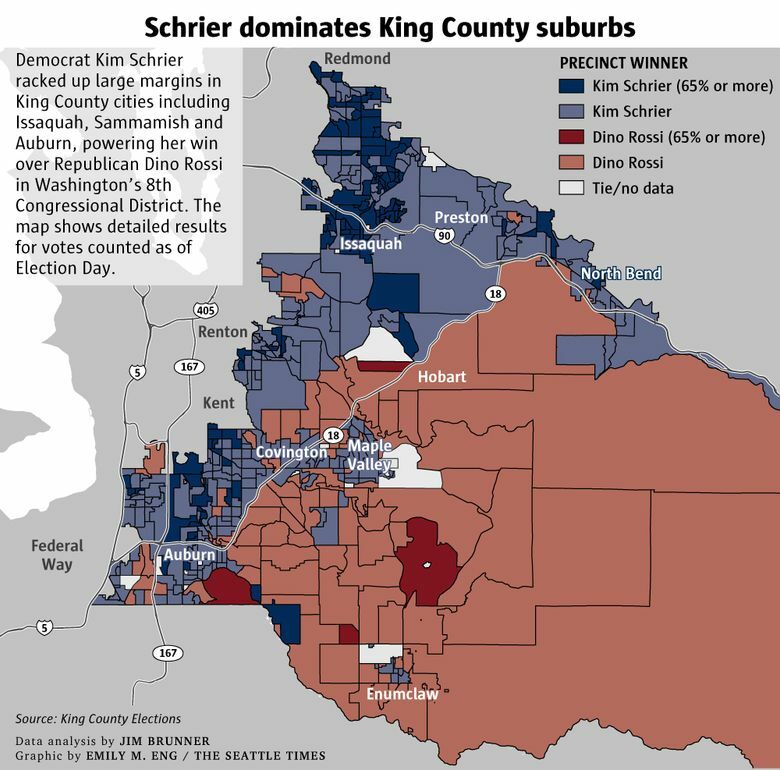 Schrier became the first Democrat to win the 8th District since its creation after the 1980 census. She was in Washington, D.C., this week for orientation as part of the Democrats’ new U.S. House majority. Vote counting is continuing and final detailed precinct-level data won’t be available until the election is certified at the end of the month.